It is used on modern surfaces such as laminates, sealed MDF and solid wood as the final product to be applied to the surface before dispatch. This is because it produces a soft feel, pleasant odour and removes any dust that may have accumulted. On antique furniture it is used to remove waxes and built up dirt and grime prior to refinishing. Some customers use it regularly to create a pleasant smell inside furniture drawers. 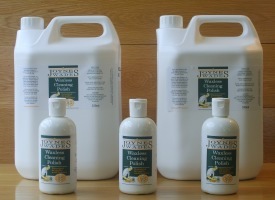 We are pleased to announce that we have been granted exclusive rights to manufacture and distribute Joynes Wade Waxless Cleaning Polish. 3M 2831 Scotch Masking Tape.